Engineering has been getting a lot of attention because of its real-world applications and clear job prospects, but learning to think like an engineer could be useful no matter what students decide to pursue for work. At Science Leadership Academy, a public magnet school in Philadelphia, all ninth-graders take a one-semester introduction-to-engineering course to help them learn how to tackle big projects. That’s a skill they will need in every high school class going forward at this project-based, inquiry-centered school. SLA teachers see engineering as the perfect vehicle to get students practicing the transferable skills of breaking work down into manageable pieces, working together and learning from failed attempts. 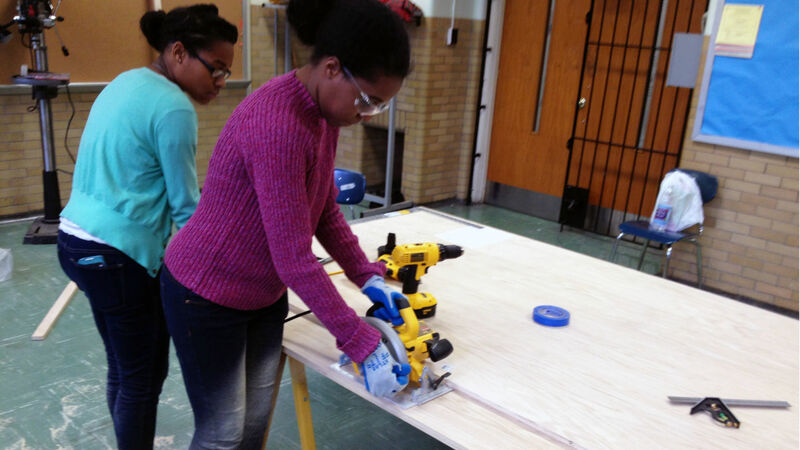 By introducing students to the built world and giving some simple ways to think about problems, they’ve also empowered students to design and build improvements for the physical school environment. And that freedom to make an impact has in turn attracted a more diverse set of students to the school’s elective advanced engineering classes. The engineering programs at SLA’s two campuses are run by two teachers who used to work in the industry and remember exactly which skills they were lacking coming out of college and starting their first engineering jobs. “I felt like I didn’t know how to make enough stuff,” said Chris Pilla, the engineering teacher at SLA Beeber (a second campus that opened two years ago). Pilla worked as a mechanical engineer at Lockheed Martin before switching to teaching. “I didn’t have enough experience working on and planning out a really big project,” he told educators gathered at the school’s annual EduCon conference. That’s what he tries to give his students in high school. SLA Beeber is co-located with a middle school in a big old building that doesn’t have any of the open collaborative spaces teachers and students would like to have. But rather than seeing that as an insurmountable barrier, Pilla has incorporated the challenge of changing the physical spaces around the school into the engineering program. They started by building a makerspace to house all their tools and provide workshop space for various ambitious projects going on around the building. “There was a huge advantage of doing that over paying an architect to design and build everything,” Pilla said. Every Wednesday afternoon from 1 to 5 p.m., Pilla and a handful of committed students worked on building the makerspace into exactly what they wanted. It took six to eight months and over 1,000 hours of manpower. But because students were so involved in its design and construction, they care a lot about keeping it neat and functioning, and want to help other students learn about it. “It’s slow, but it’s tremendous for them because they know they’re building something that will be used by the school,” Pilla said. The team intentionally built big glass doors into the makerspace so students walking by get curious about what’s going on inside and drop in to find out. The students who were most involved in constructing the makerspace are now so competent with the tools and protocols of the space that they are teaching assistants for Pilla. When students newer to making come in excited to take on a project, the old hands help them get up to speed on the skills. And a lot of those projects are about improving the school itself. “We want to make sure that they can take control of the physical environment where they go to school,” Pilla said. That’s a radical idea, but it has been a tremendous way to engage students who might not otherwise be interested in engineering. “It’s bringing in new people who might not have been into building the makerspace itself, but now they found a need in the building and are starting to get more involved,” Pilla said. Two girls who showed no interest in making or engineering before came to him with an idea to build a reading loft. They had identified a lack of quiet reading space as a school need and are now building it. They’re also taking engineering as an elective. When kids are excited about what they can design and build, it makes it easier to excite them about more traditional engineering topics, too, Pilla said. Early on in his teaching, he tried to teach students about circuits. They gave up quickly and lost interest because it wasn't connected to anything. But after they'd had a chance to prototype their own projects, build them, fail and try again, they had much more appetite for harder engineering challenges put forward by their teacher. The SLA Beeber students and teachers have a lot of space to repurpose, which is both a lot of work and a luxury. 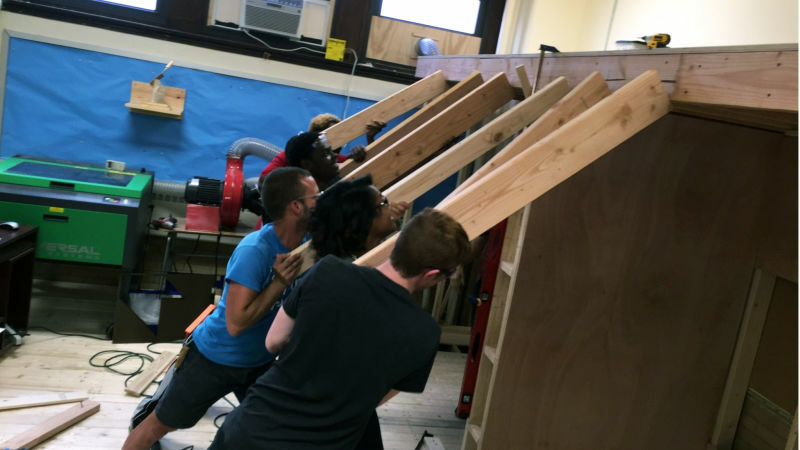 At the Center City SLA campus space is tighter, but engineering teacher John Kamal still encourages his students to solve problems of design they see around the building. “We’re just taking over any little places we can find,” Kamal said. 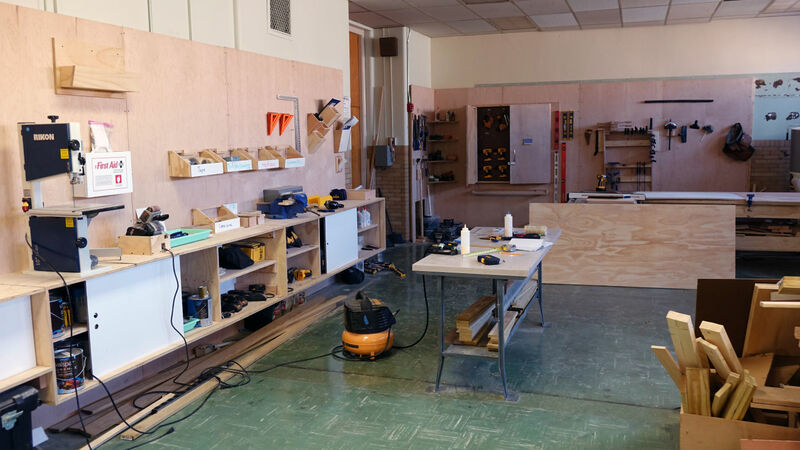 Students noticed a hallway outside one classroom wasn’t being used for much, so they put up double doors and turned it into a storage room for some making equipment. 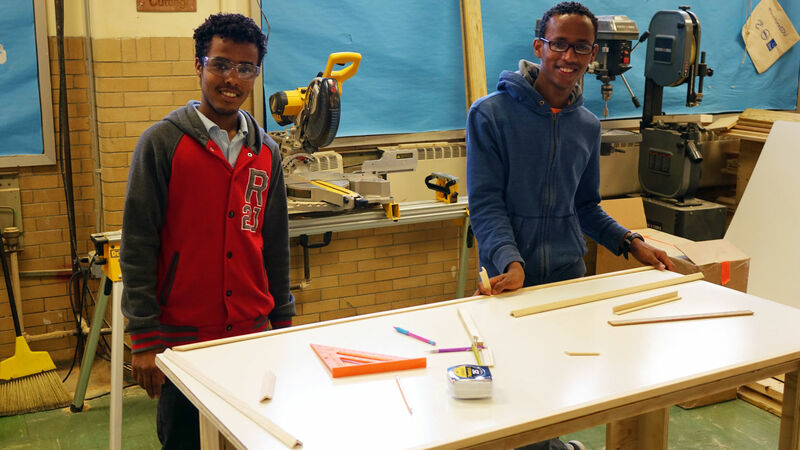 Kamal and his students also converted a chemistry lab into a machine shop, putting the big equipment in the center of the room where the tables used to be and having students sit at the countertops in the back for times when direct instruction is necessary. Using an engineering lens as a way of thinking about problem-solving and then letting students actually design and build solutions to those problems has made engineering a much more approachable subject to many students. Kamal said his goal has always been to draw more minority and female students into the discipline. Two years ago 70 percent of the engineering students were boys, partly because the courses were all electives. Now 41 percent of students in the program are women, up from 30 percent. “I come from a family where everyone builds and what-not, but I was never really involved in it,” said Tiarra Bell, a senior at SLA Center City. Design drew her into engineering. She experimented with architecture and industrial design, but has really become passionate about furniture design. She now makes and sells her own furniture. “It’s really cool because I’m a female and I’m teaching all the guys to do stuff,” Bell said. Kamal and Pilla meet with an advisory group of engineering industry professionals periodically to make sure their program is truly equipping students with the skills they’ll need to go into these fields later. When they ask industry experts the core skills required for good employees, no one mentions the ability to do differential equations. Instead, the qualities experts list look a lot more like what every teacher in every subject wants to see from students. The experts say students need to be able to write, to find problems, to communicate, to Google, to understand constraints. They need to be creative, take thoughtful risks and have a “fearlessness to leap.” One project the SLA teachers have devised to help students work on all these skills is a massive Rube Goldberg machine with 70 moving parts designed by 30 people working together. There are lots of opportunities to fail on this project, but Pilla said he’s going to let the project continue until students have some success. “I realized I wasn’t giving kids enough time to succeed after they failed,” Pilla said. He likes this project because it requires a lot of communication and careful design, as well as the ability to break a big project down into its many pieces and work on them step-by-step. As students move into higher-level engineering electives at SLA (robotics, senior engineering, astronomy and space sciences, MakerSpace, electronics and programming), they get more and more control over the problems they’ll tackle, which is a challenge in and of itself. “We are so used to coming in and having our engineering teacher giving us a problem and a set of restraints,” said Javier, a senior at SLA Center City. In the advanced engineering class, the seniors run the whole class themselves, with Kamal playing more of a coaching role. “We realized this is our class, it’s not his class, and he didn’t chime in until the very end to reflect,” Javier said. He’s found it to be good practice to sit down with peers and push one another to do the best work possible. Currently they’re working on designing a solar cooker that can be built out of materials in Madagascar, since it’s too expensive to ship parts. “I don’t like engineering because of engineering,” Javier said. “I like engineering because of what it does for the rest of my life.” This multitalented young man is a self-described painter, writer and endurance runner. He says when he finishes a tough calculus problem that unlocks some part of an engineering challenge, it gives him confidence that he can finish a long run. “To me it’s not about becoming an engineer in college or after. It’s about the critical thinking and the challenges and the creativity that comes with it,” Javier said. There was a collective sigh of longing and admiration from the educators in the room when he said that. What teacher doesn’t want his or her students to feel that way? “We as educators are trying to develop whole people and that love of learning and that connectedness across the whole of life,” Kamal said. At both SLA campuses, engineering has been woven into the fabric of the school and has become a way for this community of people to come together and devise solutions that affect everyone. And they’re taking it beyond the school walls. Pilla says his students’ next challenge is to transform a swath of concrete outside their school into a playground and community garden for neighbors to enjoy.